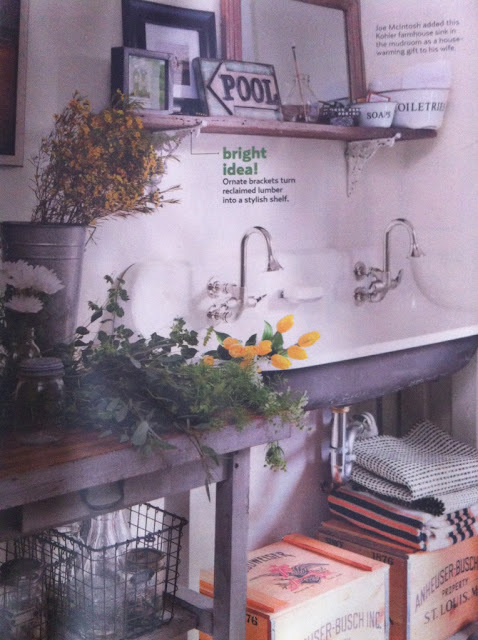 I saw this in a magazine quite some time ago, and loved the look of having vintage brackets/corbels with reclaimed wood as shelving. I think I also just love the vibe of this rustic country mudroom--crates, farmhouse sink, vintage locker baskets, reclaimed wood shelving, mason jars, flowers...forget about it. So thus began my hunt for cool brackets/corbels. When I was at the flea market I found these ornate iron brackets that I loved and thought would be the perfect thing for a shelf. As I am the queen of procrastination (about that living room painting project...) it took forever for me to follow through on this, but I finally have the finished product to share with you. So--first step was to get a piece of pine board. 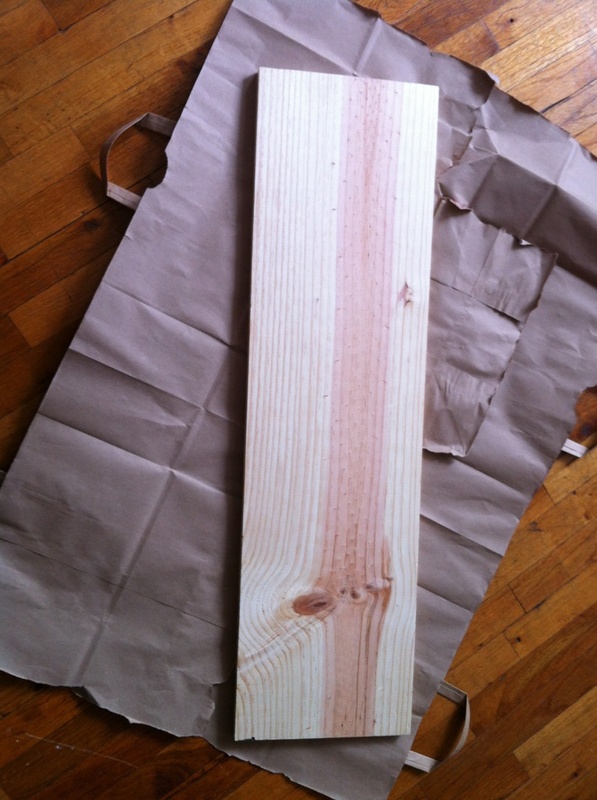 I got a big piece cut to size at the Home Depot. The rest of the wood was claimed by my boyfriend as karate boards to break in half. Yes, that was said in all sincerity. Anyway, got the pine board, and Minwax wood stain in Walnut and Special Walnut. It took me quite a bit of time to find the right stain. I originally wanted a driftwood stain but the sample chip was missing and I didn't want to risk buying if I couldn't see what it would look like. After spying a DIY pipe shelving unit made by Morgan from The Brick House I decided I really liked the stain she used, and my brackets are the same color as the piping so I knew it would look good. She used Dark Walnut and Walnut and mixed the two stains together to achieve the desired color. I followed suit with my own staining, albeit with Walnut and Special Walnut. Mixing the two together, I used a sponge brush to stain the wood, letting it sit for a while before wiping off any excess with a cloth. I played with the stain and did maybe a 60/40 ratio lighter stain/darker stain. You have to let it dry for a few hours before its ready to use. 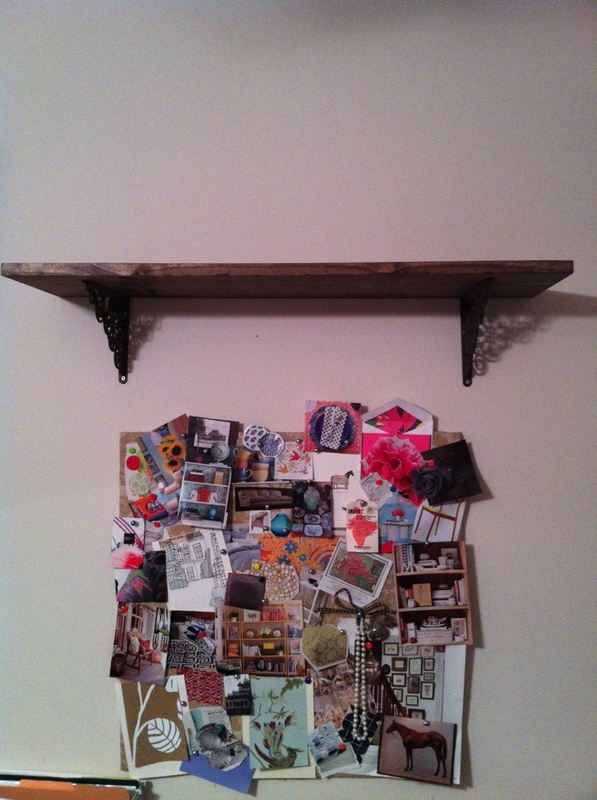 I then affixed my brackets measuring 4" in on either side of the shelf. The brackets have to be fixed so they will sit flush against the wall. My piece of board was a little warped so one bracket is just a hair off the edge of the shelf. With DIY projects, these are the types of things you just have to work with. (Did I spill my stain mixture all over myself and the floor? Maybe, but I worked with it. Now I have sweats specifically for wood staining.) After all the measurements were set we drilled it right into the wall, and voila!